Ladies undergarments have changed significantly through the centuries. Personally, I can’t even imagine “waist training”… and wearing a corset with the intention of minimizing my waist. 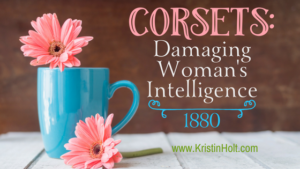 But it wasn’t just about constricting soft tissue… corsets actually funneled the ribcage into a tighter vee, thus increasing the overall effect of a tiny midsection. 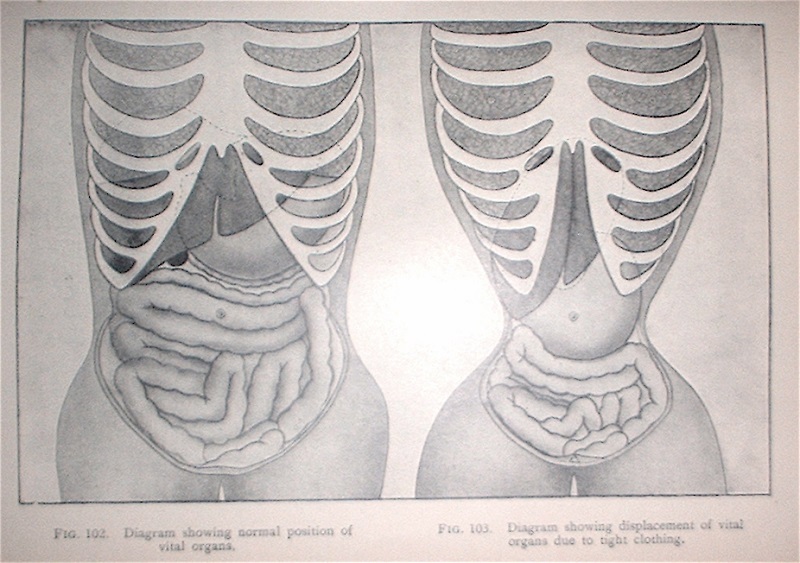 A distinguished anatomist William Henry Flower published a book in 1881 demonstrating by text and illustrations the deformities caused to female anatomy by corsets. This did not prevent his wife and four daughters from wearing them. Corsets were marketed as a health necessity, and conscientious mothers put children in corsets as early as five or six years of age. 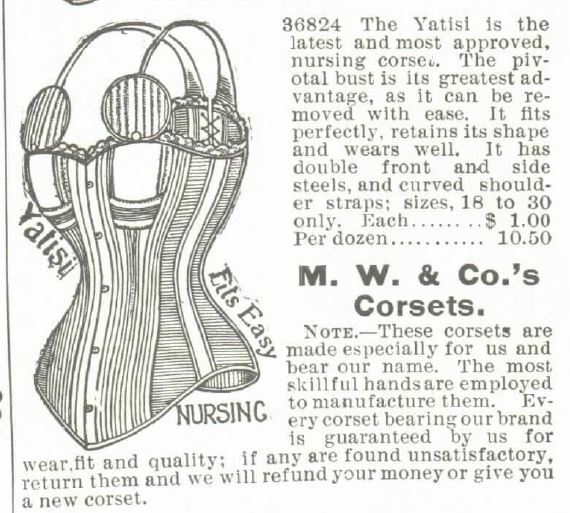 Corsets were touted as a good-health measure. I’m not surprised women in the 19th century would give up comfort for sake of fashion (because we still behave this way today— why else would we wear high heels?). As the Empire silhouette (think Pride and Prejudice dresses) gave way to fuller skirts, the waist became the ultimate focus of female fashion. The corset assumed the dominant role it would hold for the rest of the 19th century. Designed to emphasize the waist, it was pulled in as required to achieve the desired slenderness. 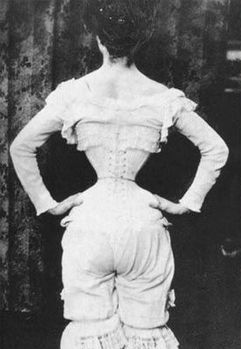 Unnaturally tiny waist measurements were considered fashionable, desirable, and smart. During the height of the ‘waspish’ waistline in fashion, young ladies reduced the 18-inch waistline to a more desirable 16-or 15-inches. 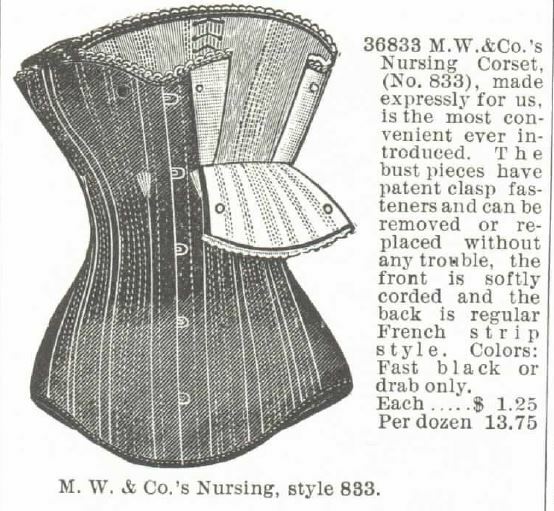 The very snug corsets were referred to as “tight lacing”, and doctors and others criticized the practice to be met with pushback from those who claimed to find it beneficial as well as enjoyable. 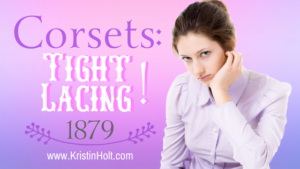 Dr. Lindquist’s Corsets ad. The Winfield Tribune of Winfield, Kansas on February 4, 1885. 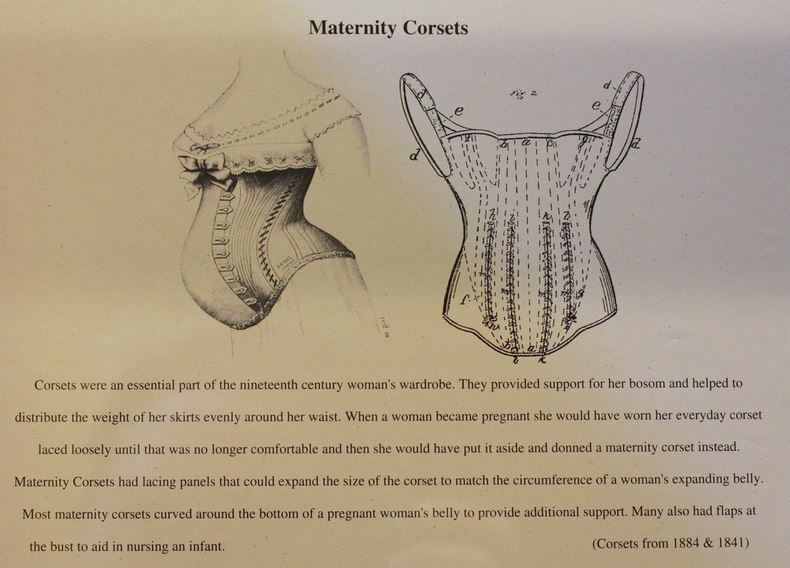 Given the general attitude about foundation garments in the era, I shouldn’t have been surprised to learn women (especially those in “civilized” and settled portions of the United States) felt strongly about maternity corsets. 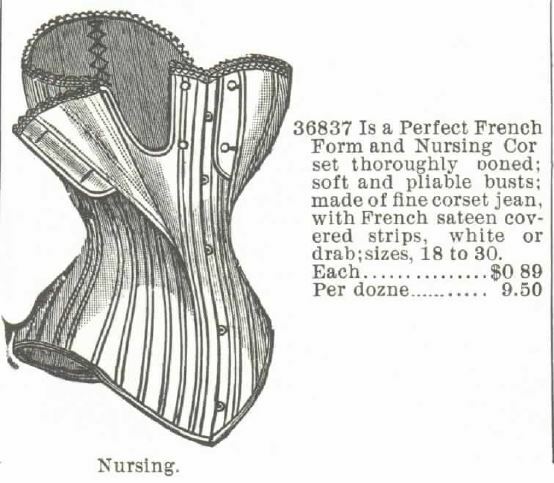 In the Journal of Social History, Leigh Summers provides a well-rounded explanation based upon a variety of sources: costume artifacts, women’s magazines, patterns, advice books, corset tracts, and advertisements to describe their design and use. 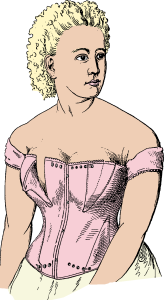 In a summary of this journal, Summers suggests that women who wore maternity corsets, as with corsets generally, were simply conforming to prevailing standards of beauty and femininity linked to respectability, reputation, and thus class status and security. 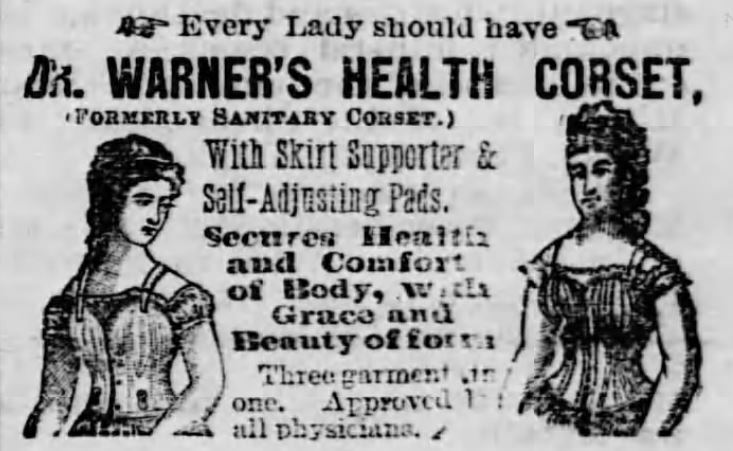 Dr Warner’s Health Corset. Staunton Spectator of Staunton, Virginia on January 2, 1877. 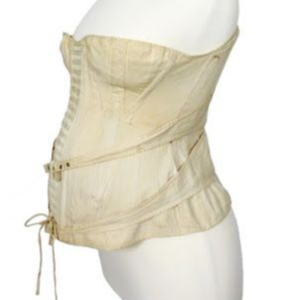 Summers contends that maternity corsets shielded the pregnant body from view and thus provided Victorian society a means of denying women’s sexual activity in conformity with prevailing ideologies. This effect allowed women greater opportunities to remain actively engaged in public longer, rather than hidden in confinement. 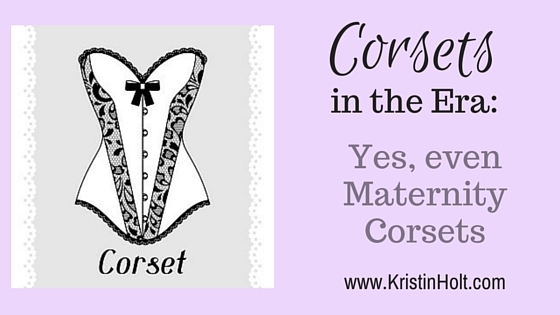 Not all corsets were meant for non-pregnancy. Many had been designed for healthful support of a growing fetus. Without one, advertisements exclaimed (and societal norm decreed), a woman couldn’t possibly expect a healthy pregnancy. A Gossard Maternity Corset advertisement, exclaimed “Better Babies”… the slogan heard everywhere. The advertisement promises perfect abdominal support, and muscles of the back and abdomen are relieved. Oh, and shipping comes in a plain package. (Must be embarrassing to order a maternity corset.) Gossard certainly wasn’t the only company to advertise maternity corsets. In The Bride Lottery (Prosperity’s Mail Order Brides, Book 1), I intentionally ensured Evelyn Brandt, a sheltered young lady raised in one of the best households of the New Rich in New York City, knew very little about pregnancy. This rings true, historically, as Victorians were so repressed about matters of human sexuality it never would’ve been discussed until her impending marriage. Even then, information would’ve been scarce. Surprised I called Evelyn Brandt and her family Victorians? It doesn’t matter one whit that they weren’t under English rule; the mere fact that Victoria sat on the English throne made it the Victorian Era throughout the English-speaking world. Back to Evelyn Brandt and a maternity corset. I personally adore the scene wherein Evelyn uses the essential need for a corset as an excuse to discern whether Sam Kochler is interested in her as a potential bride (no matter what he’s told everyone)… or simply as a paying customer. Naturally, her friend Caroline would know something of the matter (corsets for expectant mothers) as she has younger, married sisters who have already given birth. Had my character, Evelyn, ‘behaved’ herself, been a good daughter of the Upper 500 (Father had his business reputation to maintain, after all), she would’ve married a man her father approved of… if not a man her father carefully selected. In doing so, she would have had her mother’s assistance in ordering a trousseau from dressmakers (and corset manufacturers)… and when it came time for the blessed event and she was in the family way, no doubt an elder sister and/or her mother would’ve ensured Evelyn had proper undergarments and understood when it was time to go into confinement (seclusion) until she not only gave birth to the heir but her corset did fit properly once more. I wasn’t making any of that stuff up. True historical expectations. In today’s world, women have the flexibility of working right up until they deliver and returning to work (and the public eye) as soon after birth as wished. Women wear whatever they want to for maternity clothes… snug fitting, loose fitting, boyfriend-fit jeans that ride so low on their hips ‘maternity’ pants aren’t necessary. Wouldn’t the suffragists be delighted?